The modern Army uses a lot of highly sophisticated computer systems to keep things moving, equipment functioning, and troops safe. The Computer/Detection Systems Repairer, which is military occupational specialty (MOS) 94F, doesn't have the most exciting job title. But without these soldiers to repair key computer components, the Army and its soldiers would be at a disadvantage. If you have an affinity for tinkering and repairing small electronics, can focus on your work for extended periods of time, and can perform well under stress and as part of a team, this job may be a good fit for you. Of course, any background working with computers and components would serve you well if you're applying for MOS 94F. These soldiers repair and maintain hundreds of different types of computers and parts. This list includes microcomputers, telecom equipment, field artillery digital devices, GPS systems receivers, switchboards, telephones, distance and azimuth-orienting devices, and battlefield illumination devices. They're also tasked with repairing and maintaining nuclear, biological, and chemical warning and measuring devices. MOS 94F inspects all these types of systems for any faults and conducts troubleshooting to ensure they're in top operating condition. They repair and replace defective parts, service tools, and test and diagnostic equipment. In addition, these soldiers provide technical assistance to subordinates and supported users, and will request and maintain authorized bench stock, repair parts, supplies, and technical publications. 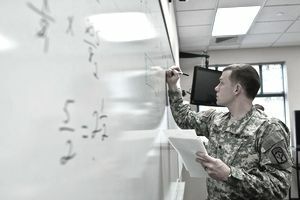 Job training for an Army computer/detection systems repairer includes the standard 10 weeks of boot camp, formally known as Basic Combat Training, and 25 weeks of Advanced Individual Training (AIT). While you'll spend some of this time in the classroom, you'll also have the opportunity to practice repairing and replacing equipment parts. You'll learn electronic principles, how to use and maintain electrical and electronic test equipment, and equipment repair techniques for specific Army computer systems. It stands to reason that qualifying for this job requires some demonstration of electronics capability. You'll need a 102 on the electronics (EL) segment of the Armed Services Vocational Aptitude Battery (ASVAB) tests. Although there's no Department of Defense security clearance required for this job, you must be a U.S. citizen and should have successfully completed one year of high school algebra and general science. Normal color vision (no colorblindness) is also required. Even though much of the work you'll be doing will be on Army-specific equipment, you should be well-positioned for a variety of civilian careers with the training you'll receive in this job. You can work as an electronics repairer on commercial and industrial equipment, or as a supervisor or manager of mechanics, installers, and repairers.